Northern Territory schools will have access to a Social and Emotional Learning (SEL) curriculum by the end of 2017. Informed by school feedback following recent trials of the program,the curriculum will provide a whole-of-system approach to positive behaviour and social and emotional learning to assist students to develop as healthy, resilient young Territorians. data system to support schools with decision making about student wellbeing, engagement and behaviour. Jilkminggan School is one of 59 Northern Territory Government schools participating in the Social and Emotional Learning trial. Feedback from the trial has been collated and will be used to improve the curriculum before it is implemented in all Northern Territory schools in 2018. School Principal Jess Robinson started trialling the Social and Emotional Learning Curriculum at Jilkminggan at the start of the year after having successfully implemented it at Bulla Camp School. “It was phenomenal,” she said. “At Bulla Camp School It significantly reduced reported behaviours and made a huge difference to the school, and the feel of the school. Ms Robinson said as part of the curriculum an hour of school time is dedicated to social and emotional learning in all year levels from transition through to the senior students. She said the curriculum had been tailored to Northern Territory schools and classrooms, which was particularly important when working in a remote environment. The activities at Jilkminggan have included matching emotion cards with storytelling for transition students and talking about peer pressure and looking at the resources available around drugs and alcohol for secondary school students. 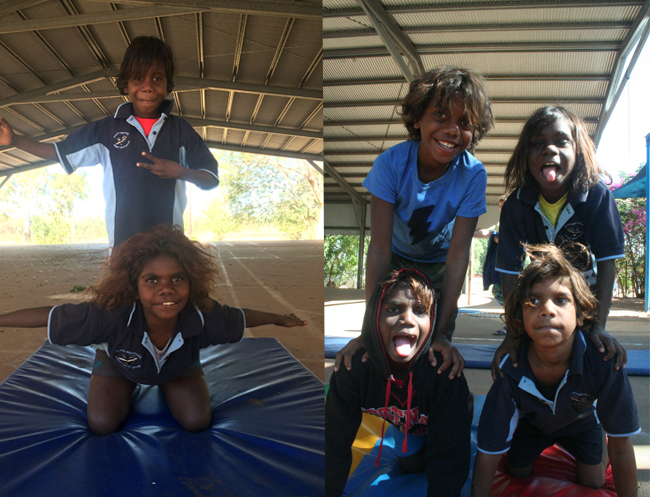 “For the middle primary kids they had to figure out how to flip a mat without stepping off it. This activity was about communicating with each other, team work and leadership,” Ms Robinson said. “Social and emotional learning takes a proactive approach instead of a reactive approach. It’s been amazing for us and has already helped our school take a step into a more positive place.